"In a few years, we're not going to be able to imagine our lives without [AR]. It's that profound a platform," said Cook, sitting in the UFO-style confines of Apple's new headquarters. 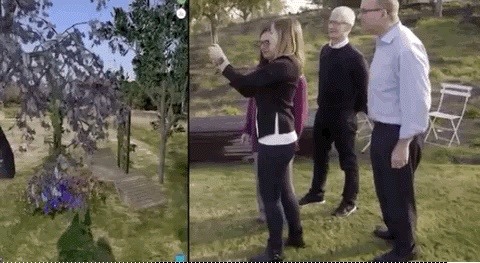 Later, Cook took the news team outside to meet Allessandra McGinnis, an AR product manager at Apple. 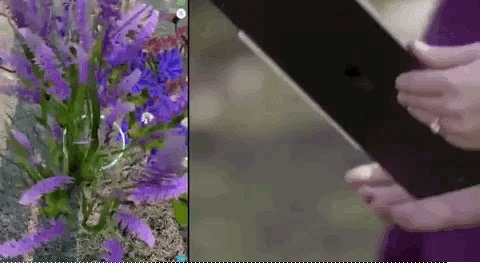 McGinnis showed off a AR app called iScape that allows users to create a virtual landscaping design that includes shrubbery and trees, as well as the the ability to control the time of day lighting to see how final work will look in real conditions throughout the day. The segment was short, but it also hit on the topic of privacy, which is another issue that will be important as AR clouds become more common and pervasive. Cook's comments on the subject come at a particularly charged time following a report in The New York Times last week. In the report, the Times claimed that Facebook CEO Mark Zuckerberg forced his executives to ditch iPhones in favor of Android phones after hearing Cook's recent comments on privacy related to Facebook's recent troubles. When pressed by Axios' co-founder and executive editor Mike Allen exec, and chief tech correspondent Ina Fried, on why Apple claims such a strong record on privacy, but still takes money from user-information-hungry Google for integration into its apps, Cook defended the relationship by calling Google the best search engine and cited the privacy controls available in Safari. At one point, when asked about the possibility of long-rumored Apple AR smartglasses, Cook was evasive, as usual. "Well the great thing about technology is there's never an end state of anything, right?" Cook told Axios. "We're always seeking not something different but something better and arguably we're at the front end of AR. And so you'll see and experience [it] in dramatically different ways in the future than you are today. But already there's some pretty cool things you can do." Overall, what stood out about the segment is that it didn't feature the iPhone, or the Apple Watch, or even the Mac. Nope. 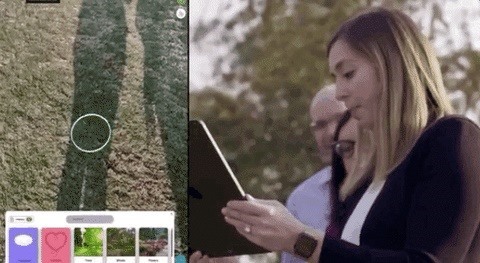 Everything was about AR (in this case, via the iPad). Any lingering doubts about Apple's seriousness regarding AR are beginning to fall to the wayside as the company begins to increasingly walk the talk. "Technology should amplify human performance and human experiences, and AR arguably does an unbelievable job at that," said Cook. "I think it's gonna change everything."